Posted on Friday, February 26th, 2010 at 9:05 am. In the Febraury 19th issue of the Traders Market Views Swing Trading report, ( I also posted on this blog) I posted a chart of the March Dollar index and said the dollar had the reaction line target objective and completed the bullish reaction cycle. 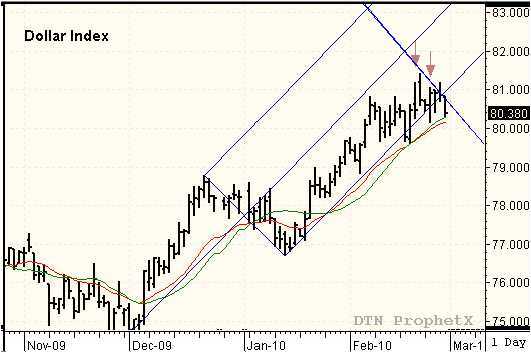 The dollar was also moving to the right of the ascending median line. I consider this a sign of weakness in the market. Based on all the evidence from the market structure and market behavior, I said the dollar was ready for a significant trend shift. Since then, the dollar tested the reaction line a second time and was rejected. As you can see from the chart, the dollar has failed at the reaction line and beginning to roll over and is currently setting up a selling opportunity. I will have updated recommendations for members in the TMV Swing Trade report. Hrmm that was odd, my comment didn’t show up. Anywho I just wanted to tell you that it’s good to see that someone else also mentioned this as it was troublesome finding the same information elsewhere. This was the first place that helped me understand this. Thank you.